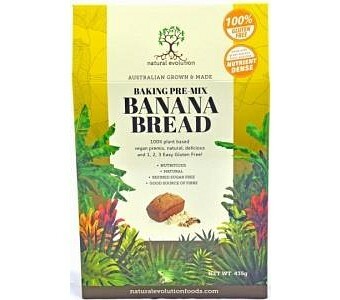 Natural Evolution Banana Bread is the ultimate banana bread – pure banana heaven! Made using the highest quality ingredients our Banana Bread will please all that want easy versatile and tasty gluten free baking. Just like the Natural Evolution philosophy this cake is nutrient dense, delicious and 1, 2, 3, easy gluten free! Evolve Naturally! A nutrient dense range of the highest quality ingredients combine into a flavour packed range of 5 premixes. These premixes deliver easy gluten free baking results. Natural Evolution signature premix range is combined with all Australian grown and made base flour components. Natural Evolution world famous Green Banana Multi-Fibre, Australian buckwheat flour for texture and protein, Australian chia seeds for protein and omega 3 and Australian rice flour to round it off. 1,2,3 easy gluten free at your fingertips, recipes that the whole family will enjoy!